A wheelchair-accessible trail leads to the enormous Grizzly Giant tree. Photo by Paul Ringgold. Mariposa Grove features new interpretive signage produced with the League’s expertise. Photo by Paul Ringgold. You may have heard that the iconic Mariposa Grove in Yosemite National Park recently reopened to the public after a major restoration, thanks in part to Save the Redwoods League. The landmark grove has always attracted big crowds, but now, because of the restoration, you may find spots for quiet contemplation. “One of the benefits of this restoration is that it will require people to do more hiking to get into the upper grove. So it’s likely going to reduce the number of visitors that are there, and give people an opportunity to have a more intimate experience,” says Paul Ringgold, Chief Program Officer for Save the Redwoods League. A grove highlight that’s easier to visit is the Grizzly Giant – now estimated to be nearly 3,000 years old – reachable via a wheelchair-accessible trail. Save the Redwoods League partnered with Yosemite National Park and the Yosemite Conservancy in the summer of 2014 for the project. Infrastructure had impeded natural water flow to the grove, and erosion from road use and construction had compacted the soil and damaged roots of some behemoth trees. Now, the road that once let cars in and out of this primeval wonderland has been transformed into a fresh, new walking trail designed to protect the health of root systems and surrounding creeks and wetlands. Visitors may now park at the bottom of the grove and take a free shuttle to a grand entrance plaza featuring an interpretive area. On top of contributing $500,000 in funding to the project, Save the Redwoods League worked closely with Allyson Carroll, a research associate at Humboldt State University, to provide information for many of the grove’s interpretive panels, as well as the ring analysis and preparation of a trunk cross section displayed in the interpretive area. The section is from an 805-year-old giant sequoia that fell in the grove in February 1954. From this sample, scientists learned that a fire occurred in the grove in 1580, and another in the late summer of 1728. In addition, forest ecologist Stephen Sillett, a researcher for the League’s Redwoods and Climate Change Initiative, scaled trees in Mariposa Grove and, for the first time ever, took core samples from the upper portions to study the baseline health of the sequoias. The goal is to study the benefits of the restoration work in the future. Through shared knowledge and appreciation, Save the Redwoods League hopes to empower the public to participate in protecting this ancient forest for future generations. 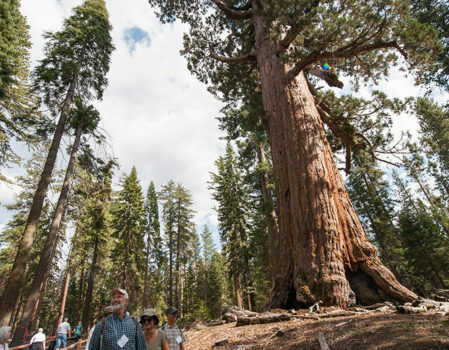 The reopening of Mariposa Grove is yet another monumental moment in the giant sequoia forest’s epic history. Learn more about visiting this historic and newly renovated grove and plan trip using ExploreRedwoods.org. The purchase of Red Hill is a watershed event in giant sequoia conservation, and a particularly gratifying achievement for the League and our donors, given that 2018 is our Centennial year. As a science-based conservation organization we are always looking at the latest redwood research to help guide our efforts to protect, restore, and connect people to these magnificent forests. Our citizen science projects are one way we engage the general public in our work to get a better picture of what is happening in the redwoods. I heard that the Mariposa grove restoration cost $40m and that the Yosemite Conservancy donated $20m of the $40m. How much did the Save the Raedwoods League donate–what was the breakdown? Thanks Bill for the question. The League contributed $500,000 in funding to the project and supplied expert input that was used for the development of interpretive materials and displays.